Never forget to take your medications again! 30-Day Money Back Guarantee. One (1) Year Warranty. Popular e-pill Medication Reminder. (click to enlarge photos) | Other MedGlider Pill Reminders | Alternative e-pill MedTime STATION Automatic Pill Dispenser. Practical Storage Space ("Lazy Susan") for all your medications, pills, tablets, inhalers, drops, syringes, vials etc. Turntable fits on your counter or in kitchen / bathroom cabinet. 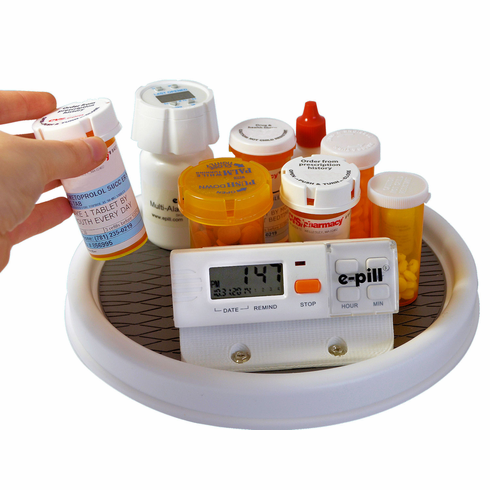 The Easy-to-Set e-pill Alarm Timer can be used stand-alone or attached to the Lazy Susan (as shown in picture). Unique "missed pill indicator". Alarms auto-reset at midnight each day. Powered by 'Easy to Replace' two AA Batteries (does NOT use "hard-to-find" button cells). Ensure patient compliance and well being - order your e-pill Medication Reminder today! FREE Standard Shipping (US only), 30-Day Money Back Guarantee. Never forget to take your medicine again and feel better! Price includes FREE batteries. Size: Electronic part 4 1/2 inch x 1 1/2 inch x 1 inch | Turntable 9 1/2 inch round x 3 1/2 inch high (pill timer can be detached from Lazy Susan). Batteries: 2 X AA (included). Battery Life: One (1) Year. Alarm: 3 Minutes with Missed Pill Indicator. 10 seconds On - 10 seconds Off. Shipping: FREE Standard Shipping for US Customers ($15.00 non-US Customers).